Our company offers a variety aggregate products for your construction needs including the Baja Cresta Decorative rock you see pictured above. Products are available both for delivery and pick up. 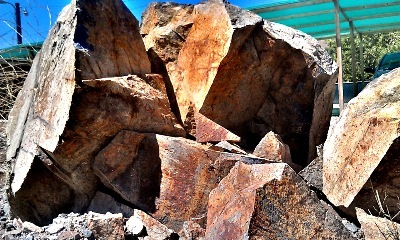 The baja colored rock is great for decorative landscaping and comes in a varity of sizes. The smallest size is 3/8" and sizes run to over 72". This rock is broken and is not a smooth round product which adds to it's decorative appeal. We offer a wide variety of construction aggregates to help you get your job done! These products are available for both pick up and delivery. Some of the products available are 3/8" cr rock, 1/2" cr rock, 3/4" cr rock, 1" rock, 1 1/2" cr rock, washed plaster sand, washed concrete sand, class 2 base, ballast rock, rip rap, fill sand and 3" track out rock. Other products are available so if what you need isn't listed please give us a call. We have trucking services available for hourly haul off from job sites. Dump site locations are the responsibility of the customer and must be scheduled in advance. Hourly rates are available upon request. We would like to thank Cassandra Kettles for the photography used in this website, also MKE Transportation, Jeff Brommer Trucking and Mike Siebert for the use of showing the equipment in operation.